This one, “Doubt everything. Find your own light” was found on Facebook. It’s in several books, mostly from the 21st century, although I’ve also found it in a 1991 book called “Armageddon the Musical,” by Robert Rankin, attributed to the Buddha. Unfortunately I don’t know where Rankin picked up the idea this was from the Buddha. The Buddha’s last words were more like “Behold now, bhikkhus, I exhort you: All compounded things are subject to vanish. 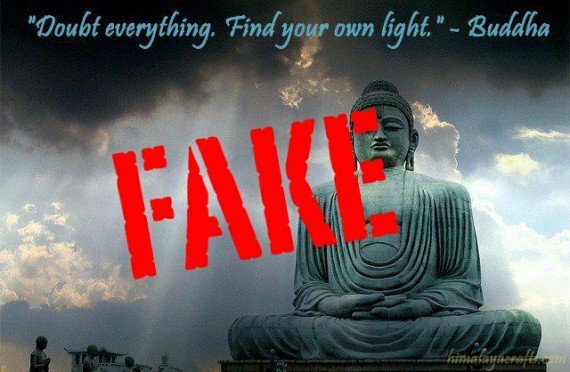 Strive with earnestness!” He did, not long before his death, exhort his monks to be “islands (or lamps — the Pali is ambiguous) unto themselves,” which is (in the minority reading) not a million miles away from the them of “light.” But “doubt” was not a term that the Buddha used in a positive sense. Doubt was seen as one of the fetters binding us to samsara, and also as one of the hindrances preventing us from attaining meditative states. The closest the Buddha seems to get to praising doubt is in the Kalama Sutta. The Kalamas told the Buddha that they were perplexed and full of doubt because they were hearing conflicting teachings from visiting holy men. And the Buddha replied “Of course you are uncertain, Kalamas. Of course you are in doubt. When there are reasons for doubt, uncertainty is born.” This doesn’t actually praise doubt as a spiritual quality — it just says that it’s understandable that the Kalamas have doubt. All this is saying, really, is that the Buddha used the word “doubt” in a very particular sense. He meant it in the opposite sense, in fact, to the meaning we often ascribe to it, which is an activity of enquiry which seeks to dispel untruth and reveal truth. To the Buddha the term doubt invariably (as far as I know) meant a kind of confused state, and often a kind of willfully confused state, in which one neither sees the truth nor wants to see the truth. Next Next post: Is Twitter Wrong?